if you are american, you can probably feel your blood starting to boil at the prospect of not making bacon out of a perfectly good pork belly. calm your ire. put down your pitchforks. there is no need to storm my front door and execute me for treason. the truth is, in other parts of the world, pork belly has all kinds (i.e. non-bacon related) of uses. you might not find them as delicious as good old-fashioned crispy bacon, but they are at least worth a try. in japan, buta-bara 豚バラ is pretty darn popular. you can find it in almost any kushiyaki/yakitori restaurant in the country. the fattiness of buta-bara makes it an excellent meat to grill over high heat, and it cooks relatively quickly when sliced thin and skewered. some restaurants sprinkle it with nothing more than a little coarse salt and black pepper. other dip it in their house tare before and after they grill it. but pork belly isn’t just for skewering in japan. sometimes buta-bara is cubed, simmered with daikon in a sweet soy broth, and served chilled with sliced ginger. foods traditionally cooked over high heat (such as fried rice, yakisoba, or vegetable stirfry) also have a high chance of containing a little bit of cubed buta-bara. the high fat content keeps the ingredients from sticking to woks or cast iron skillets. personally, i love to slow cook my pork bellies. in the oven or on the grill, a big block of pork belly can turn into one heck of a delicious meal with little to no effort. all it takes is a proprietary blend of spices and herbs, some aluminum foil, and a few choice vegetables. remove the pork belly from its packaging. ready an extra-large piece of plastic cling wrap. put the belly on top of the plastic wrap, then drizzle a little bit of olive oil over it. sprinkle the salt all over both sides. massage everything in with your finger tips. next, sprinkle the rest of the spices all over the surface of the meat, massaging as you go to get them to stick. this bit is important, so don’t leave it out. wrap the belly as tightly as humanly possible in plastic wrap. make sure you create a tight seal so as to keep all the delicious flavors in. put the belly in the fridge and wait anywhere from 2 to 6 hours. ready a big piece of aluminum foil. in the middle of the foil, place the curried pork belly. if you are worried about sticking, drizzle a little more olive oil over the top of the whole ordeal. cube the butter and set it on top of the meat. seal the package as tightly as you can. wrap it in a few more sheets of foil if you are worried about leakage. we’ll use the juices later, so don’t let them escape the foil if you can help it. if using a conventional or toaster oven, you should cook the belly for a little more than an hour at a temperature of about 170°c. that being said, this recipe also work just as well on the grill. set the package off to the side of the grill at the start of a barbecue party and forget about it. when you finally remember it is there, the meat will more than likely be all ready to go. it’ll come out great, i promise. after an hour, open the package (taking pains not to burn the ever-loving heck out of yourself with the steam). do not spill the juices. it would be such a waste to throw away that much curry infused pork fat. put the meat back on the grill (or back in the oven) for a few more minutes without the foil. if you are using a grill, the meat should be in the medium heat zone. direct heat will burn the curry coating and low heat won’t sufficiently crisp the outside. 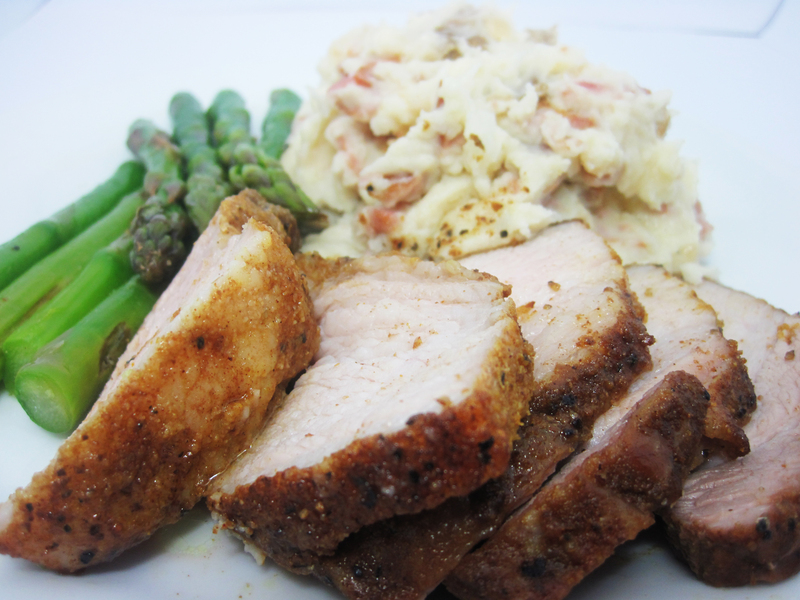 put the pork on a cutting board, slice it into nice thick chunks, and serve it alongside some mashed potatoes and steamed veggies. the moment of truth has come. pour all that delicious curry-infused sauce over the top of the plate. ready your fork and knife. indulge in the glory that is pork belly. This entry was posted in culture, dinner, japanese food and tagged Buta-bara, Curry, Easy, Grilling, Man Food, Pork, Pork Belly. Bookmark the permalink. ← diced! finals: go big or go home. YES. 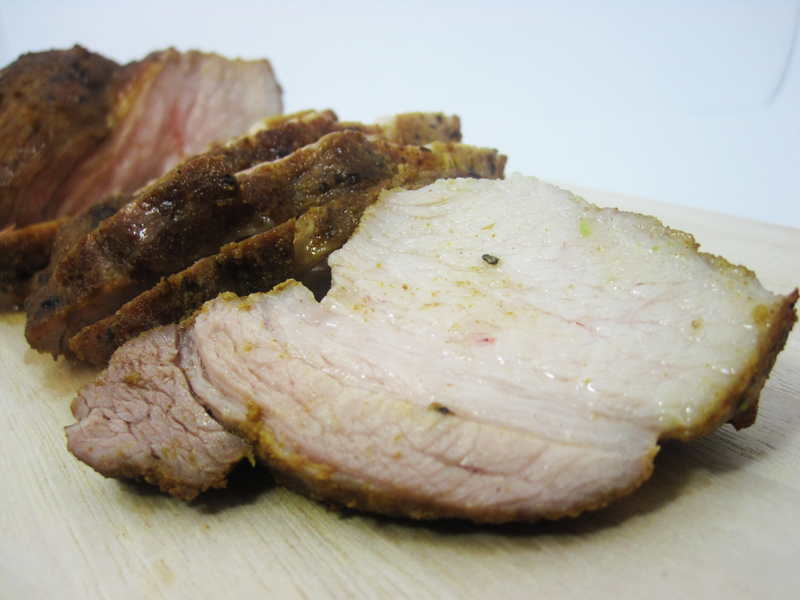 Slow cooked pork belly is my absolute favourite way to eat this heavenly cut of meat. But then again, I’m not American… so I tend to eat fat bacon rashers rather than the thin streaky ones. That could confound the results of this opinion poll. Oh wait… there’s no opinion poll? Never mind. Anyway… I want to make this recipe. It looks ridiculously good. Misha, you win. i win? oh boy! is there a prize or something? if you have an suggestions, feel free to throw them my direction. thanks, andy. there is nothing quite like a nice big, extra fatty block of pork belly.